The Silver Creek Model 2 Violin 4/4 Outfit is crafted in Europe of carefully selected and aged tonewoods from the Carpathian forest. This Stradivarius model has a carved spruce top with a carved flamed maple back, sides, neck, and scroll. 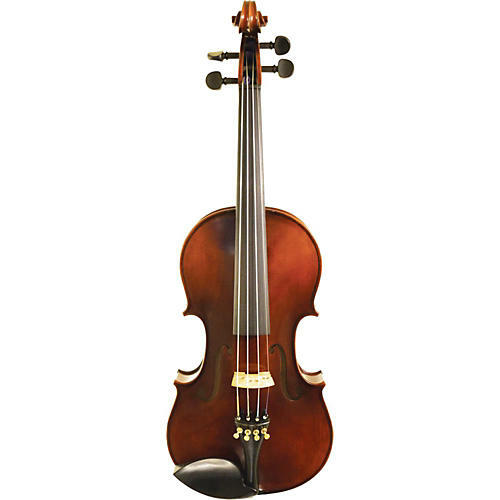 It also has seasoned ebony pegs, purfling, and tailpiece with four Wittner string adjusters, a Guarneri chinrest, French maple bridge, and beautiful hand-rubbed spirit finish. Set up and shop adjusted in the U.S. The Silver Creek Model 2 Violin Outfit comes with Thomastik Dominant strings, a lightweight case with two bow holders and Brazilwood half-lined bow.